Frédéric Mugnier’s 1990 Musigny harkens back to an earlier time in the estate’s history when Mugnier was splitting his time between flying commercial airliners and running the family domaine in Chambolle. 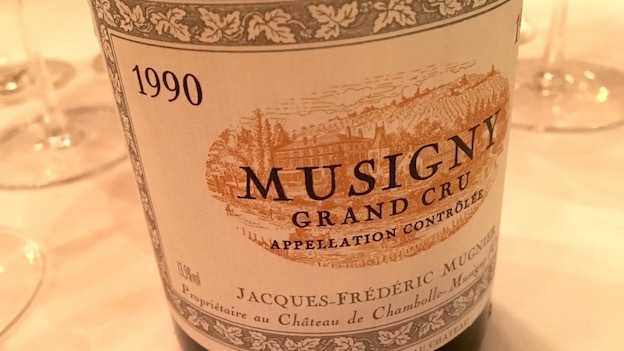 While certainly an outstanding wine, the 1990 Musigny is almost a shock to taste, as it is made with a very different aesthetic than that which informs Mugnier’s wines today. Racy, super-ripe and concentrated, the 1990 boasts tremendous depth throughout. The flavors are decidedly dark and rich, while the still-present new oak gives the wine its modern contours. There is no shortage of intensity, but readers won’t find the spellbinding purity and translucence that have made the Mugnier Musigny one of the most coveted wines in the world over the last 15 years or so. The 1990 has more than enough depth to drink well for another decade, perhaps longer, but it will never be an especially finessed wine. 92/Drink 2016-2026.